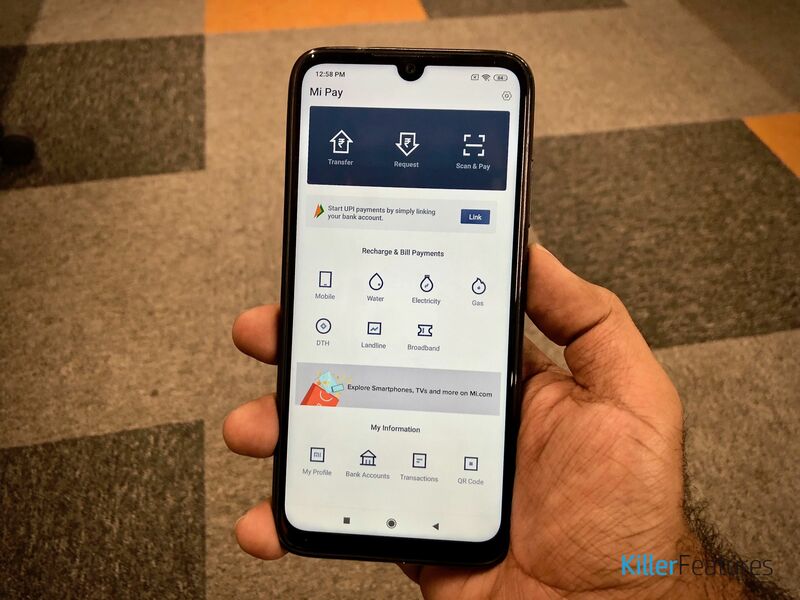 Xiaomi has unveiled its Mi Pay digital payments service in India after it was made available in beta back in December last year. Contrary to how it is available in the Chinese market, Xiaomi's Mi Pay is coming to India with UPI functionality. KillerFeatures got access to Mi Pay on a Redmi Note 7 Pro and we decided to test out the new app. The Indian market is currently flooded with UPI apps - from Google, Flipkart, WhatsApp, and the Indian government. Let's compare Xiaomi Mi Pay to the most popular UPI payment processing app in India - Google Pay (recently rebranded from Google Tez). Starting off with the design of the two apps, the newly-introduced Mi Pay has a rather clean and minimalistic interface. On top are the three most important tabs - Transfer, Request, and Scan & Pay. The app also offers additional features including mobile recharge, water bill payments, electricity payments, gas payments, DTH recharge, landline, and broadband. These are mostly all the features the app has to offer. On the bottom of the home page, you can see options like My Profile, Bank Accounts, Transactions, and QR Code for personal information access. On the other hand, the Google Pay app comes with a marquee "Tez Mode" to aid in digital payments to and from nearby offline vendors. Other than that, you can select users from your contact list to transfer to or request funds from. The UPI accounts are neatly classified into Personal and Business contacts. You also have other tabs including All Transactions, Tez Mode Transactions, Check Balance, and Invite a Friend, on the home page. As for functionality, both of these apps offers similar features. You can use both Mi Pay and Google Pay to transfer funds to or receive from any authentic UPI address, including those in your contact list. You can also use both apps to make mobile, DTH recharges and bill payments. Google Pay allows you to make bank transfers, additionally. As for promotional offers, Xiaomi has announced that over 100 units of the Redmi Note 7 smartphone and over 50 units of the Mi LED TV 4A Pro 32-inch will be up for grabs for lucky winners making payments through the app. The Chinese giant hasn't yet specified as to how users will be able to win these rewards. Google Pay, since launch, has offered a lucrative Rs 51 referral bonus for each successful user that signs up using your link. Apart from referral bonus, Google Pay also runs a regular scratch card campaign, using which you can win funds that will be directly transferred into your bank accounts. Neat, right? Xiaomi Mi Pay is currently only available on select Xiaomi smartphones in India. However, we expect it to be made available on Android, as well as iOS, in the coming few days or weeks. Google Pay is already available on Android and iOS smartphones.